It would have been very easy amidst all the hype over Alexander McQueen streaming his S/S 10 show live (though other designers have also been doing the same albeit in a more subtle fashion) with SHOWstudio to let a video camera overshadow the clothes. Then were also perhaps people logging on for all the wrong reasons (news of Lady Gaga's new single premiere as the finale temporarily crashed the streaming site). In the end it was a marriage between the pre-announced technology and Alexander McQueen's apocalyptical vision of the future where we will all be submerged under the sea. 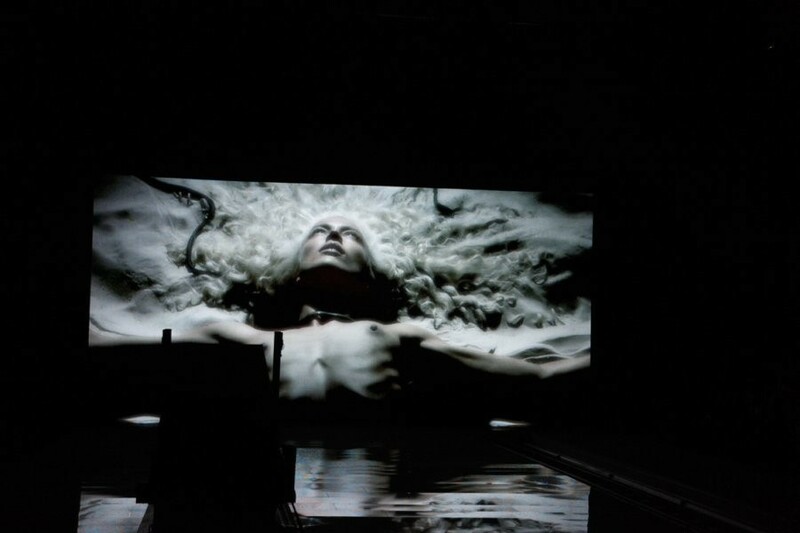 We understood his theme Plato's Atlantis from the video visuals projected on a massive LED screen, which depicted a snake goddess of Raquel Zimmerman, slinking in and out between different species of snakes and later on playing the ethereal water nymph. Then two giant tank-like video cameras roamed the catwalk stage giving us a plethora of video angles shown on screen, and alongside these two roving beasts, the women that McQueen envisioned as evolved sea creatures also slowly glided about (glide being the operative word as the shoes were killer with their 10 inch curved heels and hoof-like front). Lee McQueen was singularly tunnel visioned with what he wanted out of the clothes. He's not about the bend to beige and pastels when he can execute an intensely detailed digital print that is so perfect in symmetry you wonder who is the OCD perfectionist trying to match the prints, line for line, ruffle for ruffle. These sea reptile prints were then worked into hourglass short dresses that emphasised the curves of the shoes and were all carried out in a multitude of sea colours that didn't just stop at blue and green. A discernable strand of ready to wear came with a portion of dolphin grey and black rubber-like suiting and flappy skirts with more conventional nods to scuba wear. Organic cell organisms were also briefly explored with organza freeform grey structures that cocooned the body. The final irridescent metal beaded dress and leggings left the right shimmering impression that will be permanent both on the internet and in that old-fashioned thing called memory.